TNFUSRC Recruitment 2019 - Apply Online for 564 Forest Watcher Posts in TNFUSRC, Tamil Nadu on Direct Recruitment. 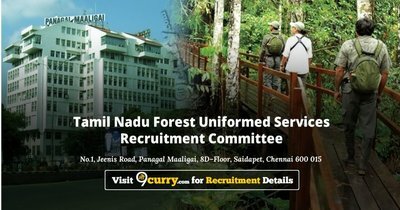 Online Applications are invited by Tamil Nadu Forest Uniformed Services Recruitment Committee from May 1st Week to May 3rd Week for 564 vacancies. Applicant will be required to undergo a Physical test consisting of a walk over 25 km and 16 km to be completed in four hours by male and female / third gender candidates respectively which will be conducted by the TNFUSRC. Eligible candidates may apply online at TNFUSRC's website (direct link is given below) from 01 May 2019 to 15 May 2019.